The Jagera and Turrbal Aboriginal clans had lived around the Brisbane river for a considerable time period before European settlers arrived, but the exact length is hard to pin down. Aboriginal occupation of Australia dates back around 40,000 years (according to most scholars at least) and there is no evidence to suggest that the Brisbane river and Moreton Bay region, with it's ample supply of food, would have been left uninhabited once discovered. Surveyor General John Oxley 'found' the river in 1823 after a tip-off from some ex-convicts who had found their way to the region and had been mixing with the local Aborigines. He named it after the Governor of New South Wales at the time, Thomas Brisbane (in 1823 the state of Queensland didn't exist). Europeans didn't settle the region until the first convict jail was built in Redclliffe in 1824, but even that was quickly moved to the site of the present-day Brisbane CBD in 1825 after officials realised the natural bend in the river provided a pretty good barrier against escape. 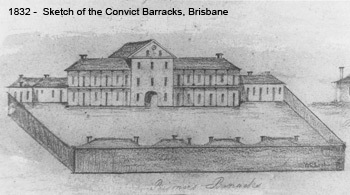 Free settlement didn't begin in the Brisbane region until 1842 because the Government initially wanted the jail kept isolated from the wider community. The usual assortment of entrepreneurs and ex-convicts quickly followed and a town began to grow around the river. By the late 1880's Brisbane was the main centre of commerce and the capital of the colony of Queensland and it was beginning to develop its own distinctive architecture and culture. The city grew steadily until World War II when it become the main allied headquarters in the South Pacific and an influx of Australian and American servicemen stretched the population to three quarters of a million. Industry flourished and continued to boom post war and Brisbane firmly staked its claim as the third largest city in the country. The 1982 Commonwealth Games were hosted in Brisbane and the city received a massive infrastructure and sporting facilities boost as a result. 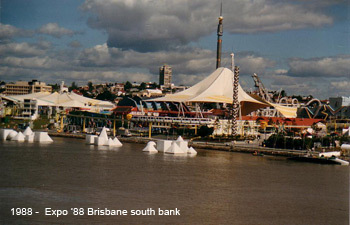 In 1988 the world expo, "Expo '88", was hosted at what is now South Bank (across the river from the CBD), and the event also helped put Brisbane 'on the map' so to speak. Brisbane has always struggled behind Sydney and Melbourne in the cultural stakes, but the city now has a thriving arts scene and is responsible for some of the best live music and bands in the country. The Brisbane River has played an important part in the settlement, development and evolution of Brisbane. 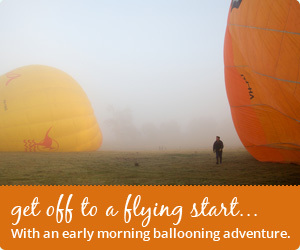 You can read more about it on our dedicated Brisbane River History page. Flooding of major rivers is almost a given, especially in sub tropical climates. The Brisbane River has flooded numerous times with several serious floods resulting in loss of life and massive repair bills. Read more about the flooding history of the Brisbane river on our Brisbane River Flood History page.